A version of WhatsApp which was exclusive to the celebrities, but that was now being opened to normal users. It sounds too good to be true, right? And it is. 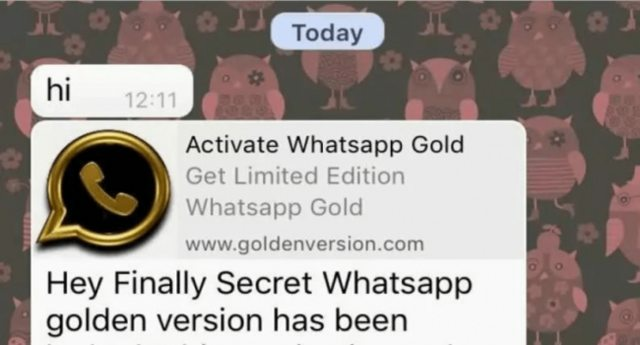 We are talking about a new online scam, which is promising users to provide free access to a special edition or premium version of the WhatsApp which is known as WhatsApp Gold. But instead of providing the premium features, what it gets is just a malware which steals the data and continues proliferating the plague. If we give one dollar each time then there is a canard about WhatsApp, we could get the total hold of the convertible newsroom. The popular instant messaging application WhatsApp is one of the easy targets for deception, because you get a lot of users in a very short period of time, as the spread of false messages is almost faster than from our Facebook walls. If you check your phone, you’re probably into several groups, Several family, friends, work, the people that salt spree, so, think about that how easy it is to copy a message and send it to another group, the spread is almost child’s play. 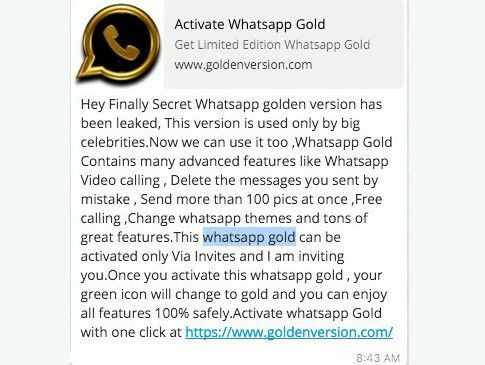 That’s how it started circulating a message that we offer to download an advanced version of WhatsApp which is known as WhatsApp Gold. In fact, it assure us that this version of the program will have the functions like video calls, delete sent messages, as well as it also enables its users to send more than a hundred photos at once. All this, as we have indicated are a blatant lie. The download edition happens only to guests through a website which is accessed by smartphone and it allows the installation of the update that would give an increased enhancement in WhatsApp. Everything, of course, a great deception, since this action actually installs malware on the device which immediately forwards the message on the Gold version of the application to all contacts, through the plague ahead and possibly creating more victims. In addition, user data are vulnerable which can be accessed by the hackers and can also be used for other purposes, like remotely control and monitoring of the device. Upon receiving such a message from a friend, the best thing to do is to avoid clicking on the link which you received and just delete it immediately, even if it comes from a trusted contact. So, just warn your friends about the infection who probably does not even know that they are infected. Hence, it will be best to keep your antivirus and protection software up to date and make sure that they are active. Moreover, if we have WhatsApp Gold installed, it will be best to reset your phone to factory settings to remove all the traces of the malware that we have introduced unconsciously in our terminal. As it always better to be safe and not rely on any of the hoaxes that are circulating in the network every bit. Whatsapp already add encryption and decryption to send/receive data. So this is just a rumor,i think so.